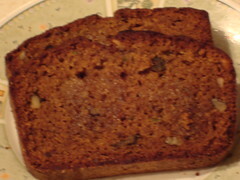 Did you know there is a National Day for Zucchini Bread? It’s true…and that day is today. Which got me thinking about my son’s recent requests for some breads or muffins using orange juice. He told me you can substitute orange juice for the water or milk in any bread/muffin recipe. I asked how he found this out and he said he learned it from the reading portion of his AIMS test, our state’s standardized test. Ha! I know he seeks and retains a lot of info, but how funny is that? Pretty cool too, seeing as how reading comprehension was my least favorite thing to test on when I was in school, even though I loved to read. In large bowl mix sugar, oil, eggs and vanilla. Beat until well blended. Add zucchini, applesauce and orange juice; stir well. In another bowl, combine flour with dry ingredients; baking soda, baking powder, salt, nutmeg and cinnamon. Add flour mixture to zucchini mixture; stir well. Pour into 2 greased and floured 9″ loaf pans. Bake for 60-70 minutes; until toothpick comes out clean. Let cool in pans for 10 minutes. Remove from pans onto wire rack and cool completely. I made a slight change to the recipe and used 1 cup wheat flour and 2 cups white flour. To ensure even cooking, half way through the cooking time I moved the left pan to the right side of the oven and vice versa. This is always a good idea when baking 2 pans of anything. The bread browned very early on in the cooking process, but it was a dark colored batter to begin with. I admit I was a little worried. Then when the zucchini bread was done baking my husband said, “That’s the best smelling bread I’ve ever smelled…it smells like *sniff sniff* pizza and pancakes at the same time.” Maybe the oddest kitchen compliment I’ve ever received. Either way, my conclusion is that this recipe makes a really awesome, moist zucchini bread that will not disappoint. We’ve all got to indulge sometimes. 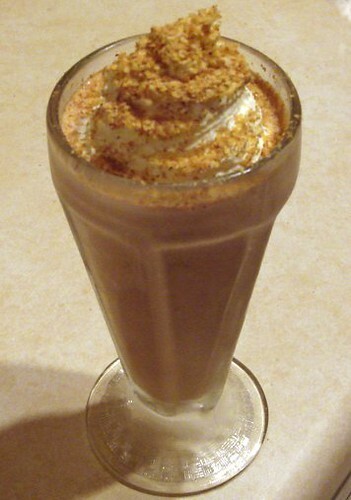 What better way to indulge than a thick creamy chocolate milkshake? I’ve found a way to cancel out the being bad part of a milkshake with a being good part. At least I like to pretend. It’s sort of similar to eating a really healthy vegetable and then smothering it with cheese or butter, but backwards. The being good part involves wheat germ, so let’s talk about it. Wheat germ is a very small part of the wheat kernel. Don’t be alarmed by the term germ. It has nothing to do with bacteria, it simply refers to germination. The germ is the reproductive part that germinates and forms the wheat grass. The amount of nutrients that are contained in wheat germ seem endless. Wheat germ is very high in protein. It has riboflavin, calcium, zinc, magnesium and vitamins A, B1 and 3. Vitamins B1 and 3 are very important to maintain energy levels and maintain healthy muscles, organs, hair and skin. Another important vitamin found in wheat germ is vitamin E. Vitamin E is an important antioxidant. Vitamin E also helps prevent blood clots and is needed to strengthen the body’s immune system. Wheat germ contains 23 nutrients in all. Oh, and wheat germ tastes really good too. It makes an awesome topping for ice cream, yogurt or milkshakes. Put ice cream in blender. Pour milk in and blend well. 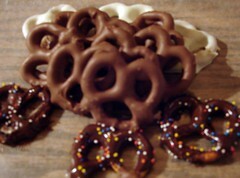 Pour into a glass and top with whipped cream and sprinkle with wheat germ. Boneless chicken breasts are probably the most popular cut of meat sold in America today. They are quick, easy and low fat. But when not cooked properly, they can be dry, tough and stringy. I have a love/hate relationship with chicken. I love chicken prepared by others mainly. When I cook the chicken, I pick on it too much. I rarely feel pleased. It’s overcooked and it’s undercooked. I keep trying though…I’m a trooper. Something to keep in mind though, when you cook chicken breasts it’s good to have them even sized. You can accomplish this by pounding them with a meat tenderizer. If you don’t have a meat tenderizer, place the chicken breasts into a large Ziploc bag and pound/roll with a can or rolling pin until the breasts are equal in thickness. Now that everything is equal, the chicken breasts have a better chance of cooking evenly. Tonight I’m trying out some baked boneless skinless chicken breasts with barbecue sauce. Really simple, just lightly salt and pepper each side of the chicken breasts, put them into a preheated 375° oven and bake for 20 minutes. Take the chicken breasts out of the oven and pour an 18 ounce bottle of any barbecue sauce you like over them. Continue to bake for another 10-15 minutes. I kicked up the heat to 400° during the last 10 minutes of cooking to try to make the coating of barbecue sauce on the chicken thicker, but I guess this sauce just didn’t have the umph. It kept sliding off. And I kept scooping it back on. And it slid off. And I scooped it back on…Fine, fine…be that way. You leave a lovely little glaze upon my chicken breasts’ tops but you are a weakling Mr. Kraft Honey Barbecue Sauce. I was pleased with the outcome. The chicken breasts were pretty bulky so the meat ended up moist, but also well cooked. 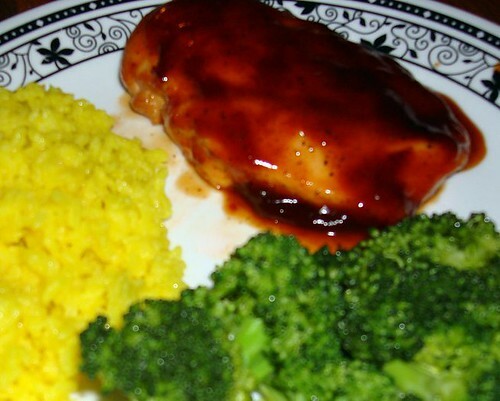 To accompany our tasty barbecue chicken breasts, we had steamed broccoli and saffron* rice. * The saffron rice is a whole other story, I may go into another time. For many people, Tuna Noodle Casserole is like a childhood classic. 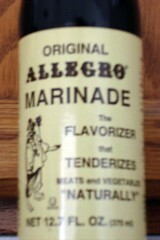 Somehow though, my family never ate this when I was growing up. We had tuna. And we had casserole…but no Tuna Noodle Casserole. 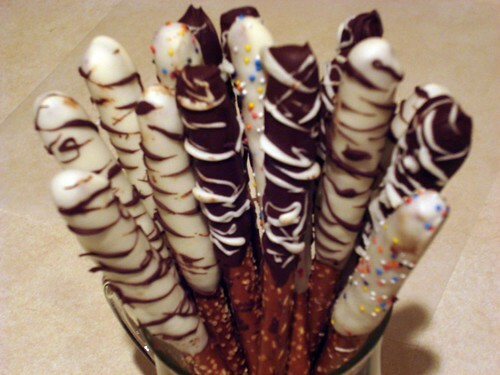 So now I am thinking I better make this. See what all the fuss is about. There’s a thousand fancy ways to make Tuna Noodle Casserole. Adding chopped celery and onion, pimiento, chopped parsley…cheddar, sliced mushrooms, even broccoli…the possibilities are endless and mouthwatering. Oh well. I’m going to go about this the old skool way and only the the most basic ingredients are allowed! And a really simple recipe, so let’s check it out. Grease an 8″ square casserole dish. 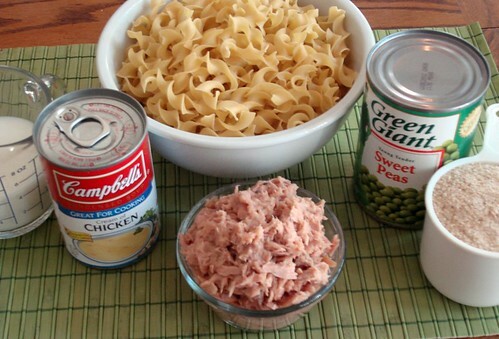 Flake tuna into the dish. Mix soup with milk and salt then pour into casserole dish. Add noodles and peas and mix all together. Preheat oven to 350°F and bake for 30 minutes. This casserole was really easy to assemble. All that was required was to pre-cook pasta, measure and stir. No knives needed, even. Good deal. Get the kids involved for some harmless, skill teaching fun. It tasted alright. 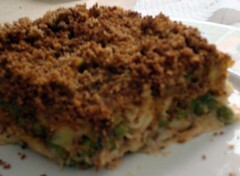 Tuna Noodle Casserole is what I expected it to be, although I had hoped it would taste better. If I were to bake this again the things I would change would be to use the small can of tuna, instead of large and I would use herb-flavored breadcrumbs, instead of plain breadcrumbs. Tuna Noodle Casserole is the kind of thing a mom should bring to the table once in awhile. It’s all part of growing up…coming to the table and getting this warm casserole-type-thing on your plate and that’s what’s for dinner. I am proud to be a part of that. Go Tuna Noodle Casserole! My version of the popular chimichanga involves frying them in Extra Virgin Olive Oil. Here’s why – It’s taste, nutrition, and integrity. Taste is the most obvious difference between olive oil and vegetable oils such as corn, soybean, and canola. These oils are tasteless fats! I mean, you wouldn’t want to eat a piece of bread dipped in vegetable oil, so why add that tasteless fat to the food you prepare? Nutritionally, olive oil contains more monounsaturated fat than any of the vegetable oils. A tablespoon of olive oil contains 120 calories, 14 grams of fat and no cholesterol. Virgin olive oils also contain the antioxidants beta-carotene and Vitamin E.
Vegetable oils are industrial, processed foods. Vegetable oils are generally extracted by means of petroleum-based solvents, and then must be highly refined to remove impurities. Along with the impurities, refining removes taste, color and nutrients. Ew? Extra virgin olive oils are not processed or refined. They are essentially “fresh squeezed” from the fruit of the olive tree, without alteration of color, taste or nutrients. Because of the integrity of olive oil, and it’s antioxidant components, olive oil will keep longer than all other vegetable oils. Olive oil is more expensive than vegetable oil, but it is worth the extra cost to have a healthier frying method that tastes so much better. So onto the chimichangas…my frying method doesn’t involve completely immersing the them into oil. I find using that much oil to be totally unnecessary. With the proper flipping method you can achieve a pleasing result with about 6 Tablespoons of olive oil and further pleasing, simple clean up after dinner! Heat refried beans according to package directions. Place tortillas on a plate, between 2 slightly moistened paper towels and microwave for 30 seconds. Scoop 5-6 tablespoons beans onto a tortilla. Sprinkle with 1/4 cup cheddar. Roll into a burrito shape, making sure the sides are sealed. Repeat with remaining tortillas. Heat 6 tablespoon olive oil on med-high heat in a pan. Place burritos, seam side down into pan and cook for about 2 minutes. Flip and cook for 2 more minutes or until browned. Place chimichangas onto a paper towel lined plate to remove excess oil and serve. Scoop the beans onto lower edge of tortilla. Top with cheese or any other fillings you may be using. Fold outer edges towards the center. Roll bottom edge up around the beans and tuck under a bit. Fold the outer edges towards the center once again. Continue rolling the burrito until you are out of tortilla to roll. This recipe will make 4 very nice-sized chimichangas, but since we are a family of three I only make 3. Everyone is full after one. 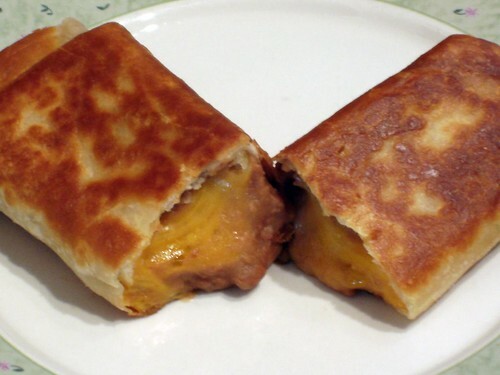 And since my son likes his chimichanga cheeseless, being the health-nut that I am, I upped the cheddar on my husband and I’s chimichanga for a cheesy good time. Tacos are pretty fun. Especially when you take the easy way out and buy pre-packaged shells. My personal rule, guacamole is a must! I never thought to try guacamole on a taco, but oh boy! Taste overload. Avocado goodness meshing with the chopped lettuce, cheese and tomatoes…mmm. If any of you are familiar with Chipotle Mexican Grill, you may know that is a place you can get a big ol’ burrito and many other things with a lot of guacamole. Chipotle is definitely not shy when you want to add some. And why would they be? They have some of the best food chain guacamole around. Even better…I came across the recipe for Chipotle’s Guacamole. Mash up avocado with a fork or electric mixer. 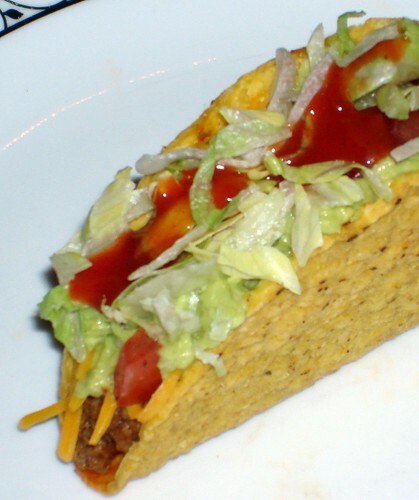 And now for my fully loaded taco…. Perhaps you’ve noticed, we love the red meats around here. No, eating red meat is not an everyday thing for us, but eyeing through my posts I notice there should be some more white-meat love shown. I will work on that. But for now, back to the red meats. High in zinc, which is important for a healthy immune system. Contains more iron than most foods, and it is more easily used by the body than iron from other sources. An increased risk of bowel cancer was found for people who ate more than two servings of red meat per week. Eating red meat every day can double the risk of osteoporosis due to an acid byproduct from digesting very large amounts of protein. A recent study found that eating more than one serving of red meat per day can double the eisk of breat cancer, especially in young women. So red meat should definitely be eaten in moderation, but for tonight I’m having steak! I used the preferred Ziploc bag method and off to the grill they went. 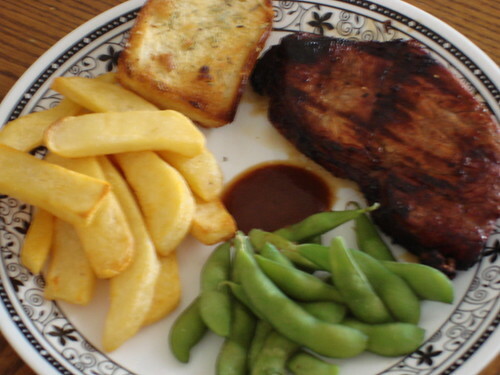 Steak fries, warm edamame, and leftover french sub rolls from French Dip Sandwiches spread with butter and garlic and toasted made this a completely filling meal. 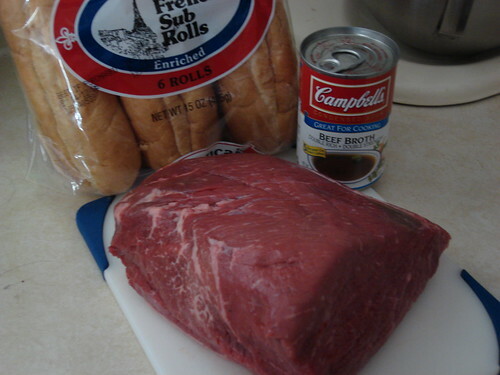 What if I told you that you could make pleasing French Dip Sandwiches with three ingredients? What if I said with almost no preparation, you can impress anyone who eats them? Can you butter toast? 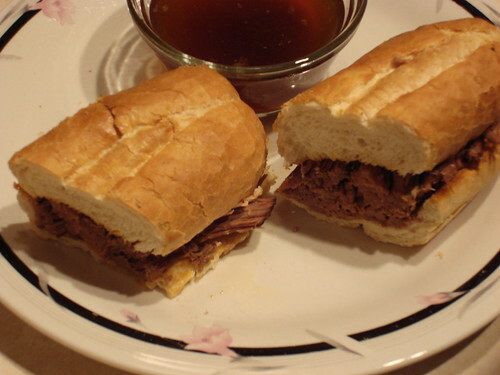 Then you can make these very Easy French Dip Sandwiches! That’s right…this is it! One 3-4 lb. roast of your choice, (bottom round roast, pictured) one can of got-to-be-mm-mm-good-stuff Campbell’s beef broth, and some French sub rolls. Looking possible already?! Yesss! You, the toast buttering champion can do this! Place roast in a crock-pot or slow cooker. Pour can of beef broth over roast. Cover with lid and cook on low heat for 7-9 hours. Do not remove lid until it’s done! Preheat oven to 400°F, split French sub rolls in half and spray each half with cooking spray (optional). Toast buns face down in oven for 3 minutes. Spoon broth into glass dishes. Shred or pull meat to fill the sub rolls. Enjoy! I cannot stress the importance of Campbell’s beef broth enough. Perhaps an accomplished cook may want to add additional flavors, but the wannabe chef (me) can only be truly gratified with the truest beefiest flavor that Campbell’s beef broth will add to this simple recipe. It’s “double rich”, “double strength” and you’ll taste the difference. No one will know you did almost nothing to accomplish this awesome meal. Eggs are so versatile. You can boil eggs. You can devil eggs. You can poach eggs. You can pickle eggs…the list goes on. You can scramble them or….you can fry them! And my favorite way to enjoy a fried egg is in a sandwich. So many good things happen in this fried egg sandwich at once. Don’t we all like to dip our fried egg yolks in toast? Face plant that yolk directly onto a buttery English muffin and emulate that exact feeling while biting into this sandwich. Add a fried piece of ham on top of the overturned egg for a meatiness that is necessary for almost every sandwich. To complete it, top with a slice of cheese for a gooey melt-it-all-together goodness that is the fried egg sandwich’s ultimate selling point. Preheat a non-stick skillet on med-high heat. When hot, add 1 Tablespoon butter and melt. 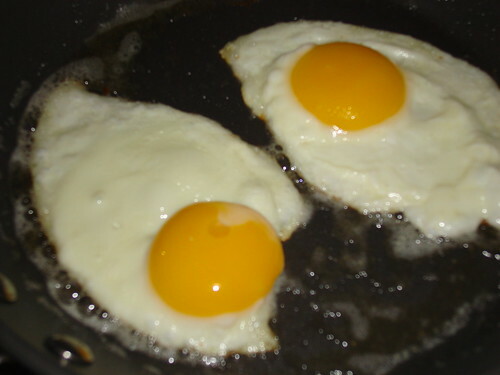 Crack egg carefully into pan and cook for 2-3 minutes or until egg white is cooked through. Meanwhile toast English muffins and butter them. In the last 30 seconds of cooking time place the ham slice in skillet to warm. Next, place the cooked egg, yolk side down on one half of the English muffin. Fold the ham slice and put it on top of the egg. 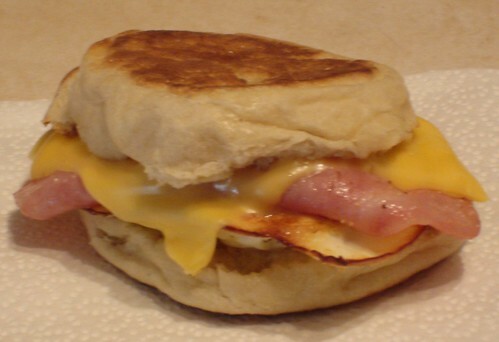 Quickly top the warm ham with the slice of cheese, followed by the remaining English muffin top. There’s no way to go wrong with this recipe if you like fried eggs and ham. Like I said, I overcooked mine a bit, as I’m still looking for the perfect fried egg method, but the sandwich still passed with flying colors. And I’ll probably need to make it again soon.